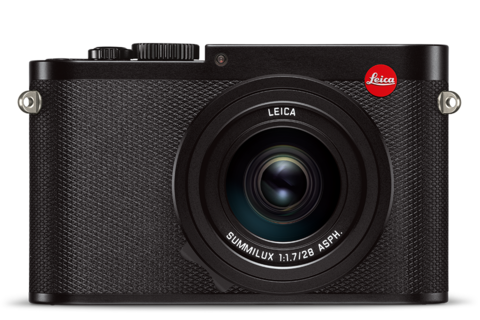 Leica Camera AG, Wetzlar, presents the first of a new line of digital compact cameras. With a full-frame sensor and a particularly high-speed, classic focal length prime lens, the Leica Q stands out due to its fast and intuitive handling. Its Leica Summilux 28 mm f/1.7 ASPH. lens makes it ideal for available light situations and has an angle of view that reproduces scenes with natural perspectives and proportions. This makes it the perfect camera for street, architectural and landscape photography. In combination with a 24 MP, full-frame CMOS sensor precisely matched to its lens, the camera delivers richly detailed exposures with extremely low noise in optimum quality at ISO sensitivities up to 50,000. The Leica Q offers the greatest possible creative freedom for realising even the most demanding photographic ambitions, not least thanks to the practical option of switching between macro, automatic and manual focusing. To ensure that the decisive moment is never missed, the Leica Q full-frame compact camera has the fastest autofocus in its class and offers almost real-time precision focusing. At the same time, its newly developed image processor from the Leica Maestro II family, specially adapted for use in the Leica Q, processes the data from the sensor at an enormous speed and delivers up to ten frames per second at full resolution. To permit reliable control of subject composition at this speed, the Leica Q also features an integrated viewfinder with a resolution of 3.68 MP. Even the finest details of every exposure are displayed without any perceptible lag as soon as the camera is brought up to the user’s eye. The digital frame selector of the Leica Q offers even more creative opportunities – alternative subject framing can be selected at the press of a button. In addition to the focal length of 28 mm at full resolution, this function also offers the equivalent of shooting with 35 and 50 mm lenses. The corresponding frames are displayed in the viewfinder at the press of a button. In the same way as with a rangefinder camera, photographers can still see what is going on outside the bright-line frame and can react much faster to changes in and around the subject. The selected framing is preserved in the JPEG image files, while the RAW files in DNG format record the entire field captured by the 28 mm lens. The Leica Q also carries forward the Leica tradition of a reduction to the essentials in terms of its design. The seal of quality, ‘made in Germany’, guarantees that only the finest materials are employed in its construction to guarantee exceptional endurance. The top plate is machined from solid blocks of aluminium, the body is made of magnesium alloy, and all lettering and the markings on its setting dials are laser-engraved. The thumb rest on the back of the camera and the diamond pattern of its leathering ensure ideal grip and clearly illustrate that form and function still go hand in hand at Leica. All functions of the Leica Q are clearly laid out and logically placed to guarantee perfect ergonomics. Its clear menu concept provides rapid access to all essential functions and also offers custom programming options: for instance, convenient definition of the autofocus limits by key control. Alternatively, the touchscreen can be used for focusing by eye, or the focusing point can be selected with a simple touch of a fingertip. In manual focusing mode, Live View offers two additional electronic focusing aids: Focus Peaking shows points in the subject that are sharply focused by coloured highlighting of edges, and Live View Zoom simultaneously lets the photographer check the sharply focused parts of the scene with up to sixfold magnification. With the Leica Q, photographers always have everything under perfect control, even without electronic aids. The two essential parameters for photography, the aperture and the shutter speed, can be read from the corresponding control elements and set – even when the camera is switched off. The unusually high speed and unmistakable bokeh of the lens of the Leica Q also reveal their unique qualities when shooting in video mode. Video recorded in full HD with the Leica Q is indistinguishable from professional movie footage. Depending on the scene, users can choose between 30 and 60 full frames per second for video recording in MP4 format. An integrated wind-noise filter guarantees crystal-clear sound. The Leica Q features an integrated Wi-Fi module for wireless transmission of still pictures and video to other devices and remote control by WLAN from a smartphone or a tablet PC. The Leica Q app for these features can be downloaded free from the Leica website. In addition to remote release and display of the viewfinder image, the app also allows the setting of parameters like the aperture and shutter speed from the device employed. Adobe® Photoshop® Lightroom®, a professional digital workflow solution for Apple Mac® OS X and Microsoft Windows®, is also included in the Leica Q package. This digital image processing software offers a comprehensive range of functions for the management, processing and presentation of digital image data. Leica Q customers can download the software free from the Leica website after registering their camera. An extensive range of technical equipment and premium bags and cases is also available for the Leica Q. These include an ever-ready case, a holster, a protector and a day bag (all manufactured exclusively for the Leica Q in finest black leather). The range also includes system bags in various sizes and styles, hand straps and carrying straps. The portfolio also includes technical equipment like the Leica SF 26 flash, a handgrip, table-top and travel tripods and a selection of ball heads (please visit www.leica-camera.com for details). Just like the camera, every item in the range of accessories and technical equipment for the Leica Q is functionally designed for easy handling and manufactured from only the finest materials to ensure versatility, reliability and a lifetime of use. The Leica Q is now on sale at authorised Leica dealers. Leica Camera AG is an internationally operating, premium-segment manufacturer of cameras and sport optics products. The legendary status of the Leica brand is founded on a long tradition of excellence in the construction of lenses. And today, in combination with innovative technologies, Leica products continue to guarantee better pictures in all situations in the worlds of visualisation and perception. Leica Camera AG has its headquarters in Wetzlar, in the state of Hesse in Germany, and a second production site in Vila Nova de Famalicão, Portugal. The company operates branch offices in Australia, China, France, Italy, Japan, Switzerland, Singapore, South Korea, UK and the USA. New and innovative products have been the driving force behind the company’s positive development in recent years.